The thyroid cartilage is the largest among the laryngeal cartilages. It is created from a right and a left lamina, which are extensively isolated posteriorly; however, they converge and link anteriorly. The most superior point of the site of combination amongst the two wide flat laminae projects forward as the laryngeal prominence a.k.a. Adam’s apple. The angle in the middle of the two laminae is more acute in men i.e. 90° compared to women i.e. 120°; as a result of this the Adam’s apple is more protuberant in men compared to women. As they diverge laterally, the superior thyroid notch separates the two laminae just above the laryngeal prominence. The superior thyroid notch and the laryngeal prominence are substantial anatomical markers in the neck. In the midline, alongside the base of the thyroid cartilage there is a less noticeable inferior thyroid notch. There is a facet for articulation with the cricoid cartilage on the medial surface of the inferior horn. A lateral thyrohyoid ligament attaches the superior horn and the posterior end of the greater horn of the hyoid bone. The oblique line marked the lateral surface of each thyroid lamina, which curves anteriorly from the base of the superior horn towards a little apart from halfway alongside the inferior margin of the lamina. The ends of the oblique line spread out in order to create superior and inferior thyroid tubercles. The extrinsic muscles of the larynx like, sternothyroid, thyrohyoid, and inferior constrictor attach at the oblique line. The thyroid cartilage is located superiorly towards the cricoid cartilage, it is another hyaline cartilage. The posterior portion of the cricoid is very stretched out, giving support by not involving the thyroid cartilage. The cricoid and thyroid cartilages shield the glottis and the entrance towards the trachea, and essential laryngeal muscles and ligaments are attached towards the surfaces provided by them. The superior surface of the cricoid cartilage connects with arytenoid cartilages. The thyroid cartilage connects with the cricoid via ligaments and two joints with synovial membrane. The shoehorn-shaped epiglottis creates a cover over glottis and protrudes superior towards the glottis. 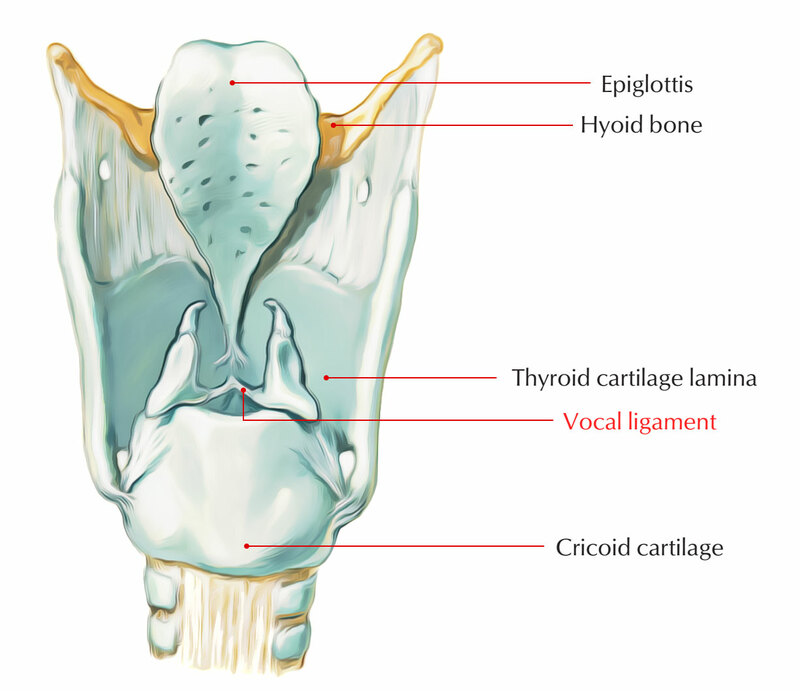 The epiglottis has ligamentous connections towards the anterior as well as superior margins of the thyroid cartilage and the hyoid bone. It is composed of elastic cartilage. The vestibular and vocal ligaments are enclosed with folds of laryngeal epithelium that protrude inside the glottis. The vestibular ligaments along with the vocal ligaments spread out among the thyroid cartilage as well as the arytenoid cartilages. The vestibular ligaments are located inside the superior pair of folds called the vestibular folds. These folds protect the more fragile vocal folds and help prevent foreign objects from going inside the glottis. The vocal folds are inferior towards the vestibular folds guard the entrance towards the glottis. The vestibular ligaments and the vocal ligaments range in the middle of the thyroid cartilage as well as the arytenoid cartilages. Since the vocal ligaments are made up of elastic tissue, the vocal folds are highly elastic. The vocal folds participate in the creation of sound, and so they are also known as the vocal cords. Another vital external landmark of the thyroid cartilage is the oblique line. It goes anteroinferiorly from a superior thyroid tubercle situated just inferior towards the superior cornu and it spreads out towards the inferior thyroid tubercle found at the lower margin of the thyroid lamina. Fibers from the palatopharyngeus and stylopharyngeus muscles and the posterior border of the thyroid cartilage join with each other. The thyroid cartilage does not have any association with the thyroid gland or its protrusions, contrary to what the name may indicate. The thyroid cartilage comprises of the vocal cords a.k.a. vocal folds. It protects and supports them. The vocal cords project inside from the larynx sides in order to create a slit through the throat. The vocalization is created by vibration of their edges and the passing airstream. Movement of the thyroid cartilage changes the tension levels making alterations in the human voice. 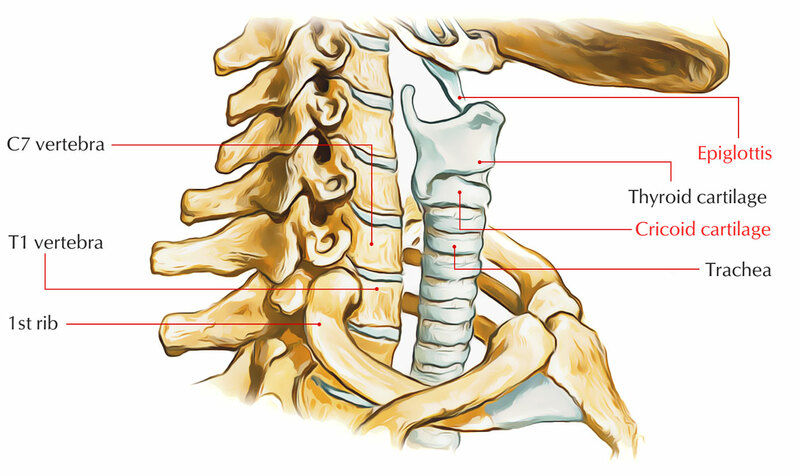 The angle that the thyroid cartilage creates with the cricoid cartilage also influences these variations. The bigger size of the thyroid cartilage makes a deeper voice, which is common in men compared to women. At the cricothyroid joint, the laminae of the thyroid cartilage move together with the cricoid cartilage. The human voice pitch adjusted as this links both the structures and helps in changing the tension and pressure of the vocal chords. 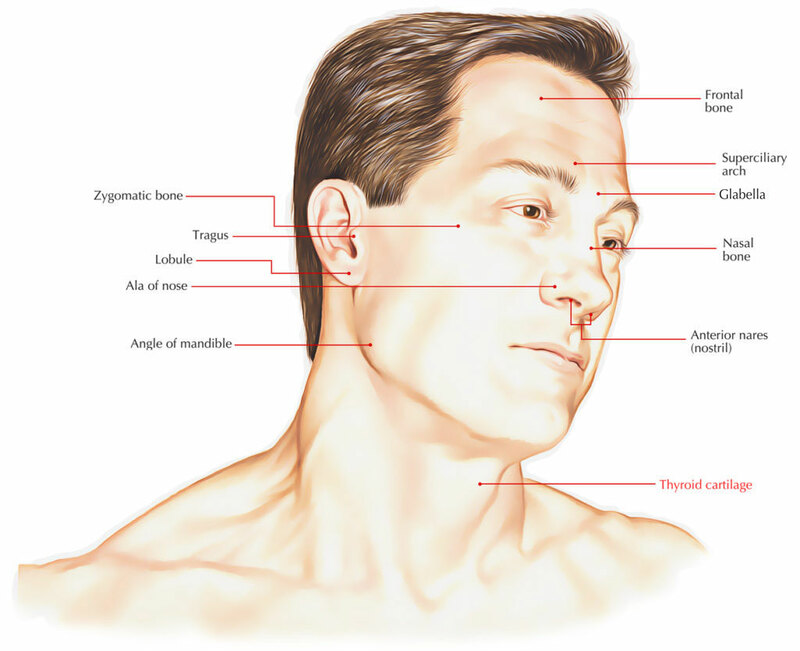 Many muscles have locations of attachment in the thyroid cartilage. A damaged cartilage can cause pain, stiffness and inflammation or swelling, but pain on a cartilage does not always indicate cartilage damage. Pain in the thyroid cartilage may occur due to various reasons. A sore throat or increased tension on the adjacent muscles or cartilage fracture may be a reason. Often the source of pain is found in areas near the cartilage and not the cartilage in itself. Sore Throat includes irritation, pain, and itchiness, along with inflammation of the throat. One may have difficulty while ingesting food and liquids. Common colds and viral or bacterial infections are the most common causes of a sore throat. Warm salt water and anti-inflammatories can treat a sore throat at home, but when the pain lasts more than a week it’s best to visit a doctor. After a complete diagnosis and determination of the severity of the damage, physician suggests treatment which consists of conservative, non-surgical or surgical therapies. There may be other causes of pain in the thyroid cartilage zone. The symptoms may be related to different types of health issues. Globus pharyngis is the persistent sensation of having phlegm, a pill or some other sort of obstruction in the throat when there is none. It is also known as globus sensation, globus or, somewhat outdated, globus hystericus, commonly described as having a “lump in one’s throat”. Swallowing can be done normally, so it isn’t condition of a true dysphagia, however it can turn out to be quite irritating. One may also sense moderate chest pain or even severe pain when swallowing along with a clicking feeling.